Thanksgiving dinner has a lot of staples: the turkey, the stuffing bread, the pumpkin pie, the yams, and more. One that is often overlooked but that plays a great supporting role during the festivities is the mashed potato. 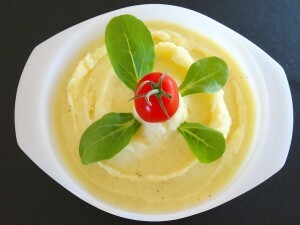 If you want to make an easy but tasty mashed potato that lasts 9 servings, follow the recipe below! After scrubbing and peeling the potatoes, begin cutting them up, trying to make the slices the same size. Place the potatoes in a big pot and cover them with cold water. Then, add the salt. Bring the potatoes to a boil. Once they are boiling, lower the heat and keep cooking them for about 20 minutes or until they can be easily cut through with a fork. In a separate saucepan, add the half-and-half, the garlic, chives, and a bit of butter. Take the saucepan to the stove and turn it on to a low heat until it simmers lightly. Set aside when it's done. When the potatoes are ready, drain them well, and mash them up. Next, incorporate the half-and-half mixture and stir it all nicely. Taste the concoction and decide if you need more salt. This is also the time to add the pepper as preferred. Make sure to mix, mix, mix. Finally, serve the mashed potatoes with some delicious bread roll and enjoy it with the rest of your Thanksgiving dinner! Get Your Thanksgiving Bread at the Best Bakery in Austin! Stop by Great Harvest in Austin to make your Thanksgiving dinner that much more special and delicious! Call the best bakery in Austin at (512) 329-9216 to place an order for your special event.